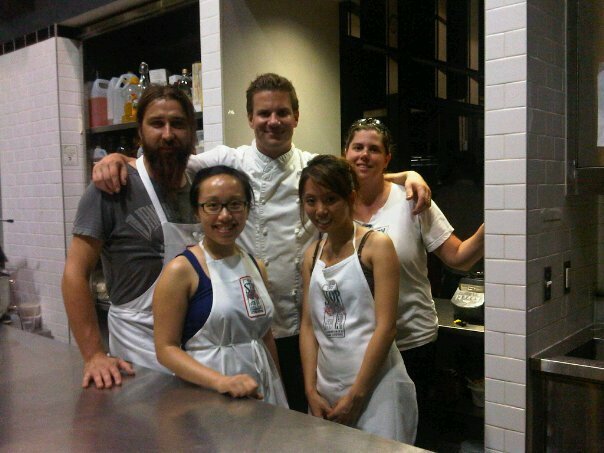 On July 21, 2011, my friend Ying and I volunteered to be part of the Kitchen Crew at The Stop Community Food Centre. The Stop holds monthly Food For Change dinners to fundraise for their organization. You can either go to enjoy the meal or to volunteer as part of the kitchen crew. We signed up for the kitchen crew. We spent the day in a kitchen on what was believed to be the hottest day in Toronto in decades (37 C with a humidex value of 47 C). Just so you know, when we signed up for this it was a few weeks before the event so we had no idea it was going to be this hot. We prepared a five course meal with a Executive Chef Chris Brown, his partner and his friend. Ying and I had no idea it was going to be the five of us preparing a five-course meal for 50 dining guests until we arrived that day. I was too nervous in the morning I couldn’t eat even though I knew that I may not get another chance to. That’s saying a lot since I love food. There were a lot of thoughts going through my head that morning: Will the executive chef be nice? Will he be more like Jamie or Ramsey? I’m an amateur, should I have practiced some knife skills? After getting there though, and meeting everyone, my nerves slipped away. Chris was friendly, funny and his hair reminded me of Jamie. Chris and his Chef partner clearly love love working together. He asked us what made us crazy enough to pay $100 to volunteer? I said that I love food but I spend more time on food blogs then I do in the kitchen. And I always wanted to see what it was like to work in a real kitchen as it was a career route I was considering in the past. It felt really weird to say this out loud to someone I just met and a real Chef at that. I was assigned many small tasks that ultimately lead to the creation of the smoked salmon crostini. After preparing the smoked salmon mixture, the chef showed me how he wanted the baguette to be sliced and after trying a few times, I still couldn’t get my bread slices from squishing down together. He patiently showed me how to slice it again emphasizing to use the whole knife. Watching him reminded me a lot of using the bow on a violin, you need to use the entire length of the knife when slicing the baguette, the same way a violinist needs to use the length of their bow when they play. There were a few firsts that day. We got to pick basil and sorrel from the garden. Straight from the garden to the kitchen! It was so hot it was like walking from one oven to another. Other than weeds, I’ve never picked anything from the garden before. I remember when we headed out, I told Ying, I can’t believe he just asked us to “go outside and grab basil”, it’s like he thinks we know what we’re doing and we have no freaking clue. Well, at least we know what basil looks like and we can always smell it to confirm. I told her that I remember coming across someone’s blog sometime ago about the proper way to “pick” things, and I wanted to make sure we didn’t permanently kill anything. So we went to the greenhouse to check with one of the workers on how to pick the basil. Luckily we did because we found out we were about to pick from the community garden and there was another garden we were suppose to be picking from. Anyways, picking was pretty easy, just tear the leaves off… easy peasey. I got to eat rabbit for the first time (I was nervous about it because I had a pet rabbit growing up and I was worried I would think of him as I ate it). But when I saw the finished product (after hours in the oven), it just looked like morsels of chicken swimming in a golden translucent broth (duck fat). I couldn’t resist, it smelled phenomenal and it was probably one of the tastiest, juiciest pieces of meat I’ve ever bit into. It’s all about the duck fat! The next day, I was searching online for where to buy the stuff and how to go about making my own duck confit. That’s what happens when I have/see something delicious, I usually try to find out how to make it. 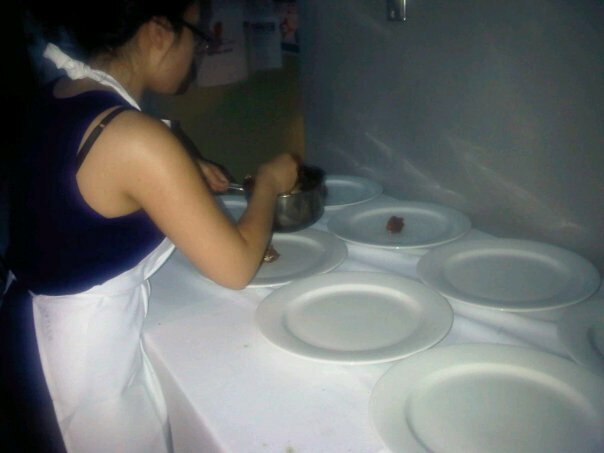 Plating was exciting. It reminded me of Food Network’s Dinner Impossible. There’s this rush to get food out of the kitchen and onto the plates. But we also have to place things onto the plate precisely the way the chef envisioned without adjusting it (it leaves streak marks) and wiping off the little dribbles of sauce here and there. This was a lot of fun! The chef handed me a pot of marinated tomatillos and asked me to just follow what he had done. So much trust. Love it! It was great to hear feedback from the guests about how good the food was. Guests passing us by as we were plating would tell us what they enjoyed and the wait staff would come back to the kitchen to tell us what people were saying about the dishes. Before dessert was served, Chris rushed the kitchen crew out into the dining hall. I felt a little embarrassed standing out there with an apron on at first because I didn’t know why we were being called out. He shared a few words about what Food For Change was about and asked the dining guests to give the kitchen crew a round of applause. It was a very sweet way to wrap up the night. Overall, it was fun to participate in the full aspect of meal preparation. Work on various small tasks and then piece by piece seeing how all the little small jobs we did culiminated into the five courses of the night’s meal. It was nice to get a firsthand look at how hard the kitchen staff works. We drank here and there (water and wine..yeah, Chris poured us some cold wine as we worked) and sampled some dishes, but there was no time for a real break to eat. Kitchen life is hard. It was tough just as I expected but I got so much out of it. This experience has given me an even greater appreciation for people that work all day in kitchen’s. That night, I left around 10:30pm in need of a shower, and completely exhausted. I felt pumped thinking about how I spent my day, everything I learned, feeling satisfied that all of our hard work in the kitchen paid off and feeling a bit sad that it was all over.